Vicki P. Losick, SK08, is studying the role of polyploidy in wound repair. 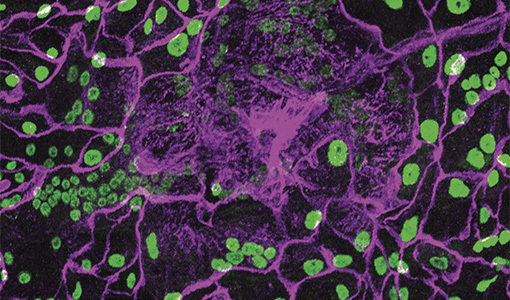 Epithelial nuclei (green) and epithelial cell boundaries (magenta). 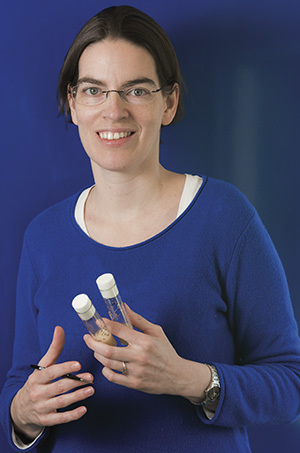 Her research, conducted on fruit flies, promises to yield a deeper, more nuanced understanding of polyploidy, which has been studied mostly in insects and plants—it drives strawberries, for instance, to become large and plump. In the body, polyploid cell growth has been largely associated with cancer and other degenerative diseases, including heart and liver diseases. But Losick hopes to identify the factors that regulate the creation of these extra-large cells “so we can harness their healing potential” and limit the degenerative consequences, she said.